as if... as if i needed any more reason to love anthropolgie. i mean, seriously! i can't get enough of simply walking into the store for nothing more than being inspired. however, once i'm in, it's hard to walk out without purchasing anything. and now anthropolgie has launched the anthropologist. and they had me at the opening page -- what is inspiration? The Anthropologist is an online space for inspiring works and inspiring individuals. sigh! i love it so!! i do find the website a bit confusing, yet rather enticing at the same time. just when i think i've figured things out, i'm back to being a bit confused on where to go next and how to get there. but i've only just begun...i'm sure soon enough, i will have every click well figured out, if not memorized. closing with a pic of ryder today, taken with my vintage polaroid. this is how i often find ryder, when watching TV. 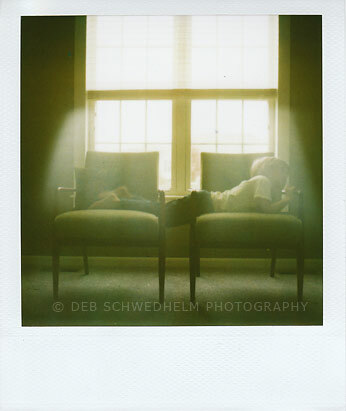 and man, i love the way the polaroid captured the light coming in the windows.